New York City Hotel Rooftops offer some of the best skyline views in the whole City. Most locals would rather head to a rooftop for the glittering views than to the top of a famous attraction any time. 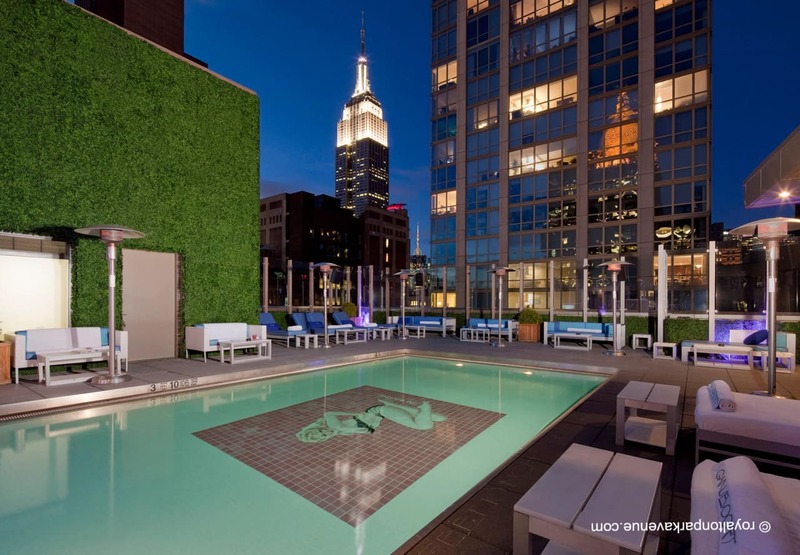 NYC Hotel Rooftops offer everything: cocktails and food, views, pools, cabanas, sundecks and retractable roofs, making many of them ideal to visit all year round. 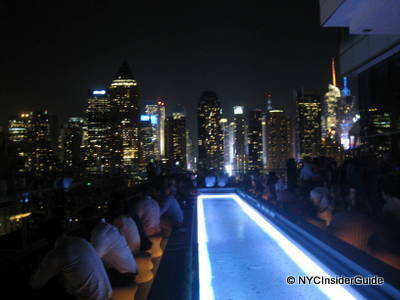 Some NYC Rooftops are even open only to hotel guests, so if you want a spectacular skyline view and maybe a private party built in to your NYC stay, check out one of our best Hotel Rooftops. 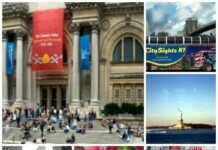 Ink48 Hotel – right next to the Intrepid Museum and my ALL time favorite rooftop! 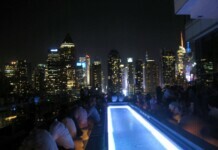 Keep reading for dozens more New York City Hotel Rooftops and check out this comprehensive guide to Rooftop Bars in NYC. Located on the Penthouse of the Dream Hotel, PHD Terrace offers indoor and outdoor panoramic views from the Hudson River to Times Square. Part Riviera, part Rome with inflections of South Beach, the decor sets the tone for contemporary elegance. Under the sun, experience the chilled out vibe and signature rooftop cocktails. Every evening, the 14th Floor, featuring the Writer’s Den and Poetry Garden and terrace transforms into Bookmarks Lounge, an intimate rooftop bar offering literary inspired cocktails, such as ‘the Hemingway,’ with city views. With both an outdoor terrace and two indoor greenhouses, this is a great spot to view all of Midtown from above. This 12th Floor rooftop lounge features 3,000 square feet of indoor and outdoor space and private chaise longue–equipped cabanas. 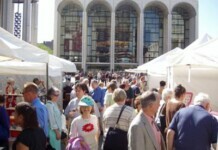 Three separate terraces offer views of Lincoln Center, Central Park, and Broadway & Columbus Avenues. The roof on the 20th floor of the Hayden Hotel (Formerly RoofBar or Glass Bar @ Hotel Indigo) has awesome views of the Manhattan skyline, along with creative drinks and lots of hummus and tzatziki. The hotel consistently gets rave reviews and is always a safe bet to book. 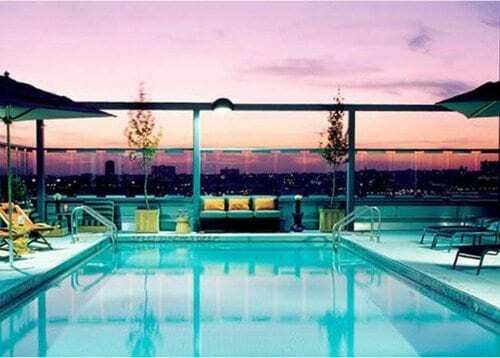 Both the Hotel Gansevoort Meatpacking and Royalton Park Avenue (formerly, the Gansevoort Park Avenue, photo), have some of the most stunning views from their indoor/outdoor rooftops in New York City, and each has a pool. See Also: Meatpacking District and Gramercy Park. Le Bain is a penthouse discothèque and rooftop bar featuring world-famous DJs, a state of the art sound system and superlative-inspiring views. During the summer, there’s a plunge pool on the dance floor and a crêperie on a “grass” covered rooftop. Don’t forget to check out the lower-level room with floor-to-ceiling windows and a Jacuzzi. Please be advised: admission is determined at entrance, and not guaranteed to hotel guests. 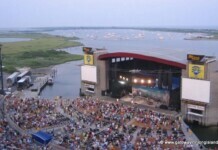 My FAVORITE Rooftop! Located on the 16th floor atop Ink48, PRESS Lounge presents spectacular views, glowing 70-foot-long reflecting pool, and light fare in a casual setting. 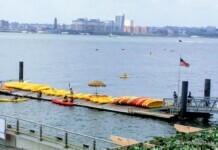 Enjoy unobstructed Manhattan and Hudson River views, expertly crafted cocktails and tasty nibbles in style. PRESS features a glass-enclosed lounge, and spacious deck with outdoor seating, with food and drink to match. A Mexican themed rooftop lounge, serving tacos, cocktails and specialty tequilas. Take the glass enclosed elevator to the 17th Floor, where the 2 floor rooftop, with panoramic city views, terra cotta, brick columns, ivy and small tables await. 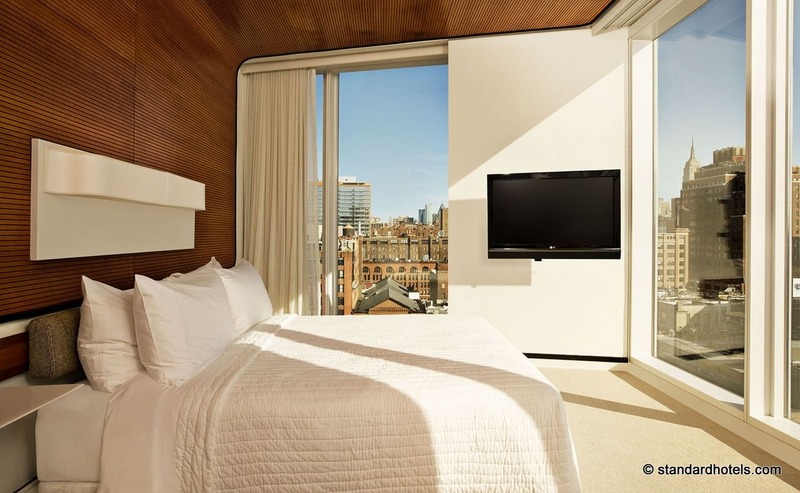 the Pod 39 Hotel is one of NYC’s best hotel deals, targeting the “Hip and Thrifty” market. Seasonal (outdoors only), opens March 12, 2017. Boasting 360 degree views of Manhattan and the Hudson River from ‘the city’s highest rooftop lounge’, Sky Room occupies the 33rd and 34th Floor of the newly constructed Fairfield Inn and Suites by Marriott Times Square. The bi-level lounge transports guests to a high energy oasis atop 40th Street and offers five distinct spaces. Located on the 15th floor, a few blocks from Central Park, Sky Terrace is a large private landscaped terrace with sweeping city and Hudson River views – all for the exclusive enjoyment of hotel guests. It is the ideal spot for soaking up the sun and enjoying a quiet drink while admiring the breathtaking panorama below. Sky Terrace is exclusively for hotel guests or by invitation only. Top of the Strand, set like a jewel on the 21st floor, is a Midtown Manhattan spectacular urban oasis. 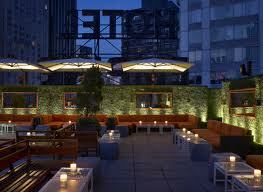 A retractable glass roof over the intimate rooftop lounge shows off the Skyline and Empire State Building year round. With a friendly atmosphere, dazzling views, cabana rentals, well-made drinks and tasty light fare, Pulse is one of New York City’s favorite rooftop bars. Summer is the perfect time to check into one of our hotels with free bicycles, an awesome roofdeck or a pool. 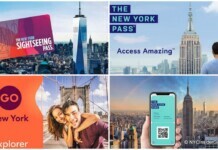 Take advantage of the many free perks offered by NYC hotels to help you get the best city views, relax at the end of a long sightseeing day, explore more of NYC and dive into the nooks and crannies of New York City you can't see any other way!